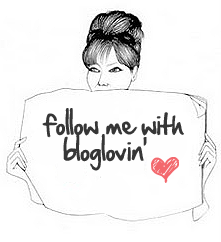 For those of you who are new to my blog you are probably wondering what does THB stand for? THB = The Home Bakers is a group of talented bakers who bake from the same book and we are currently baking from ‘Coffee Cakes’ by Lou Seibert Pappas. The group was set up by Joyce of Kitchen Flavours and anyone can join in the delicious baking fun. Each month one member gets to host a recipe of their choice and this time round I happen to be hosting and only the host of their chosen bake is allowed to include the recipe. 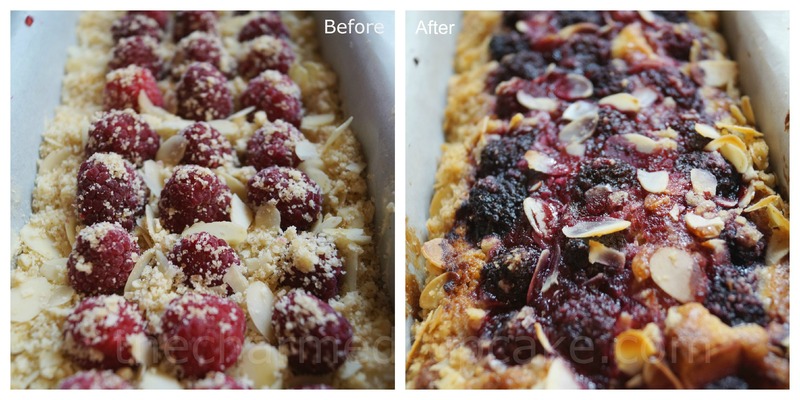 I decided to select this delicious old-fashioned coffee cake with tart, juicy raspberries which was counterbalanced with a crunchy topping. To make the streusel topping: In a medium bowl or a food processor, combine the flour, sugar, butter and nutmeg. Cut in the butter with your fingers or process until crumbly. Stir in the almonds. In a large bowl, cream the butter and sugar with a wooden spoon or an electric mixer until light and fluffy. Add the eggs, one at a time, beating well. Add the vanilla, lemon zest and yoghurt or buttermilk, beating just until smooth. In a medium bowl, combine the flour, baking powder, baking soda and salt. Stir to blend. Gradually add the dry ingredients to the butter mixture, beating just until blended. Spread the batter evenly in the prepared pan. 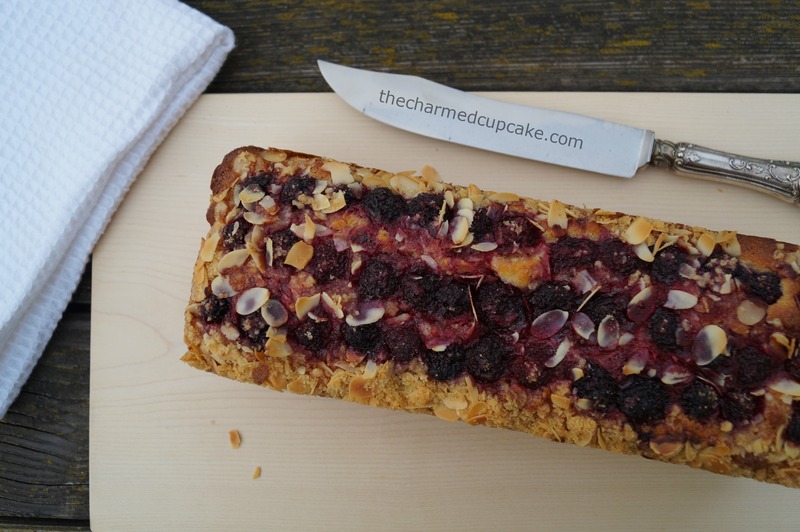 Scatter the berries or cherries evenly over the batter and sprinkle evenly with the streusel. Bake for 55 minutes to 1 hour, or until the cake is golden brown and a cake tester inserted in the center comes out clean. Let cool in the pan on a wire rack for 10 minutes, then remove the pan sides. Serve warm or at room temperature, cut into wedges. Makes one 10-inch cake; serves 10 to 12. I used a 12 x 4.5 inch loaf pan and lined it with grease proof paper so that I could lift the cake out without having to turn it upside down once baked. I doubled the measurements of the streusel as I used half in the middle of the cake. Instead of normal white sugar in the streusel ingredients I used Demerara sugar for extra crunch and brownness. I omitted the nutmeg in the streusel as I did not have this on hand. I made my buttermilk by adding a few drops of lemon juice to regular milk. I used 1/4 teaspoon lemon extract in place of lemon zest. 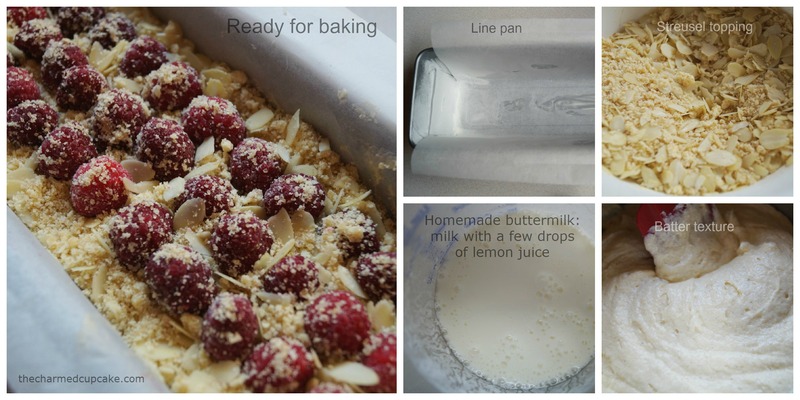 For the layered effect I spread half the batter in the pan, scattered 1 cup of the berries, sprinkled half of the streusel then spread with the remainder batter before arranging the raspberries and sprinkling the streusel. Baking time in the loaf pan approximately 1 hr and 15 mins. My cake had a very lovely brown edging because after 1 hour of baking it was still not cooked and I was a bit impatient so I turned my oven to fan force (my oven bakes cakes better without fan force) so this browned the cake very quickly. I should have known better but to wait a bit longer as a loaf pan is more compact than a 10 inch springform pan. But despite all that, the cake turned out pretty good if I might say so myself. The cake, apart from the slight browned edging, was very moist and rich. 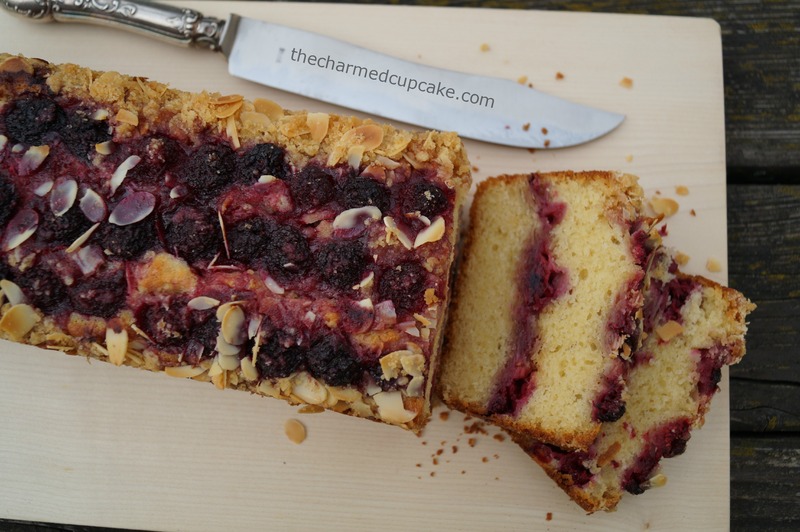 Instead of just having the berries and crunchy streusel on the top and all cake on the bottom, I decided to layer it. This gave the cake a beautiful layered design and it evened out the tart and sweetness with every bite. Not only was there crunch on the top of the cake but also in the middle. This cake is definitely a keeper in our household as I shared it with my in-laws and some good family friends and I had them coming back for more. I just love the colour contrast. 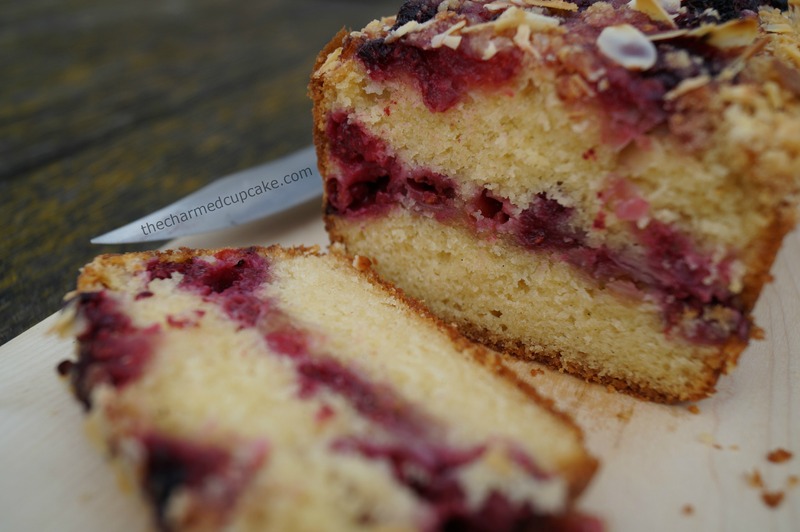 If you like the sweetness of cake mixed with the tartness of juicy berries then this is a coffee cake you will love, trust me it is delicious!! Be sure to check out how my other fellow bakers interpreted this recipe over at The Home Bakers. Whoa a lot of helpful tips. Hi Angela, your cake looks delicious and so pretty! 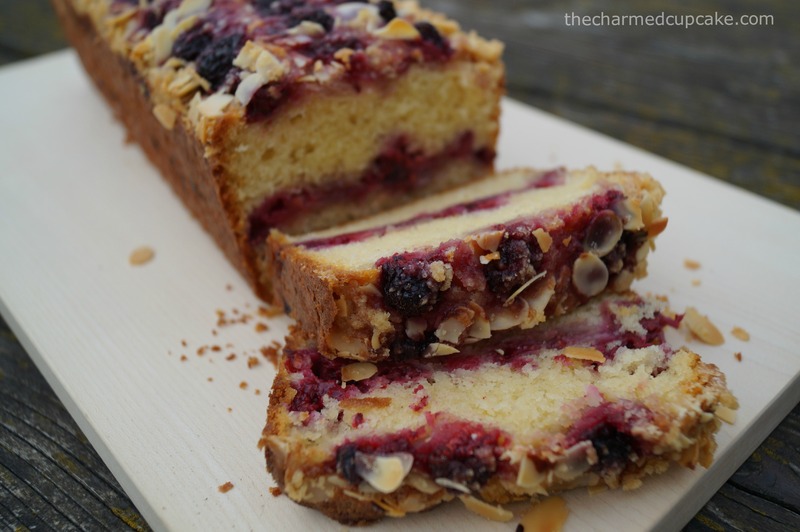 I would love to bake this too but I do not have berries….they are pricey stuff lol! I know what you mean about berry prices, we are spoilt here in Austria with fresh berries. 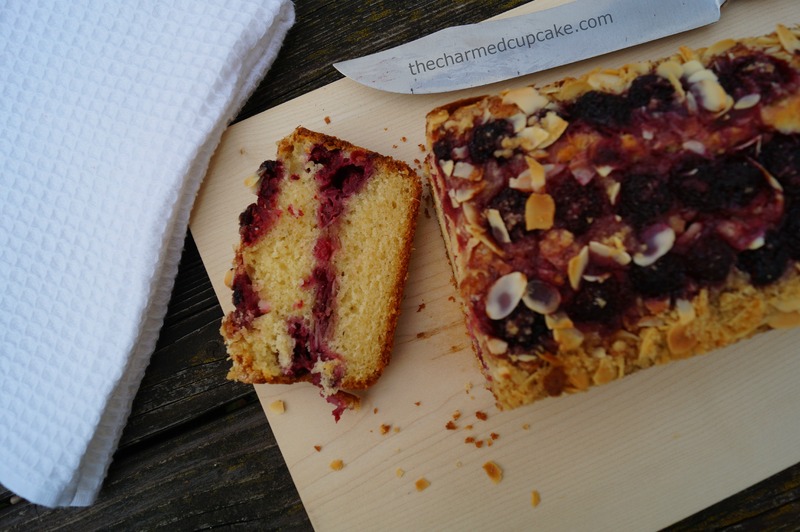 You can bake this cake using frozen berries too. This looks beautiful. I think I have not read it clearly though as I cant seem to see how many almonds are used to make the streusel topping. OooHh you have not misread it, I seem to have forgotten the almonds off the streusel ingredients list. I have updated it now. It is 1/2 cup. Welcome fellow Aussie!!! I hope you are enjoying what you see on my blog. Where abouts in S.A are you from? Thank you, we are in the Mid North of SA, about 200km north of Adelaide. I’ve never been there but I am sure it’s a beautiful place, soooo miss Australia! I’m not on either sorry. Please visit my website if you have time. Summer here has been a scorcher. We had some rain today which was wonderful. I bet your part of the world is just beautiful. WOW!! You have a beautiful catering website, glad to meet a fellow Aussie and a fellow baker 😀 Your cakes are amazing!! How are they delivered during summer?? Thank you very much, that is greatly appreciated. Country people are so relaxed, they come to my home and pick them up mostly!! I have a separate building and we have set it up for catering, I have an area for meetings with customers and pick ups. 🙂 I would love some cold, I’m a winter person and this summer we have had temps nearly at 50 degrees. Its too hot to do anything! This looks phenonemal – will definitely need to try this recipe! Thank you 🙂 you won’t be disappointed with this cake, it’s a must try!! 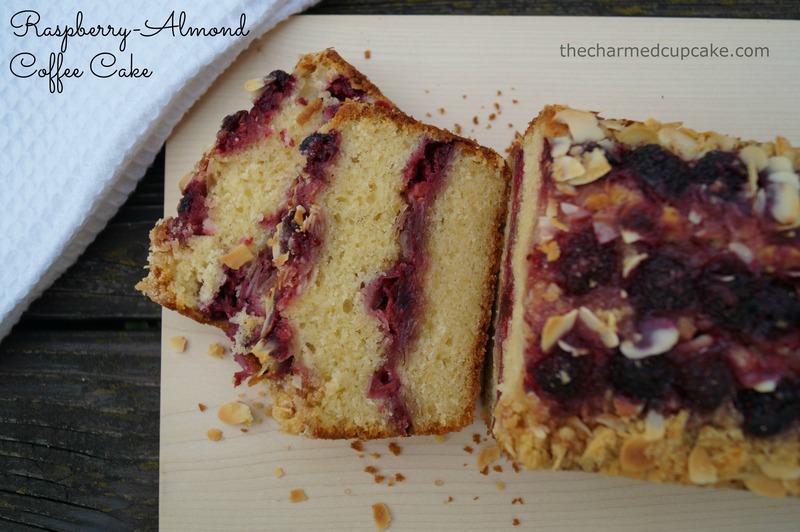 Anything with raspberry and almonds always is! 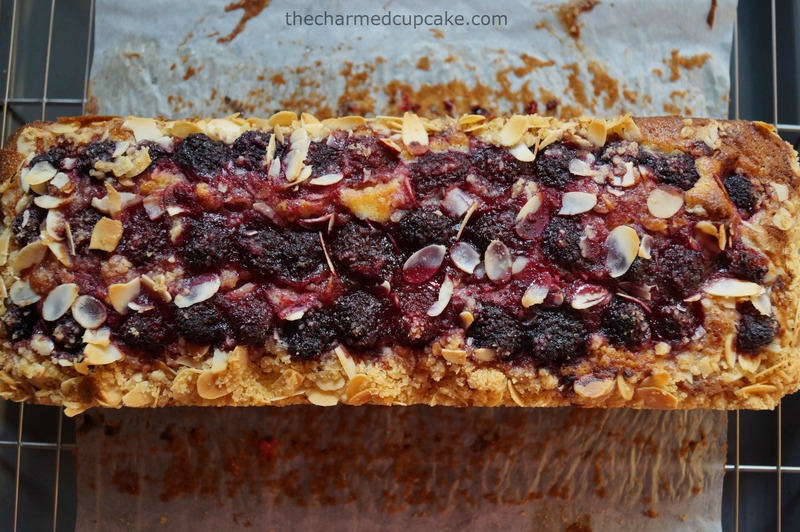 A delicious idea with the layering of the streusel in the middle! Your loaf version looks great! I’ve replaced the raspberries with mulberries, since raspberries are not easily available and they are pretty costly! This is one delicious cake, I’ve enjoyed it very much! You’re so right about the contrasts/layers. And I happen to like the browned edges as I’m sure that adds to the overall texture. I love how you layered the streusel within the cake. I’m wishing I did that too! The cake came out so pretty! Thanks Jessie!! I’m looking forward to seeing your cake. How did you like the cake? I really enjoyed this one. The raspberry and streusel combination was delicious. I’ll be linking it up tomorrow.